My daughter is going to do the Croft up for Halloween. It will look great when she has finished. My daughter’s name is Carmelline. 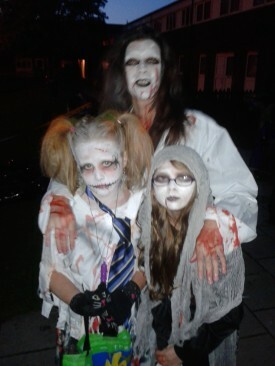 Maria and my granddaughter, Jodie Camilla dress up as ghosts. 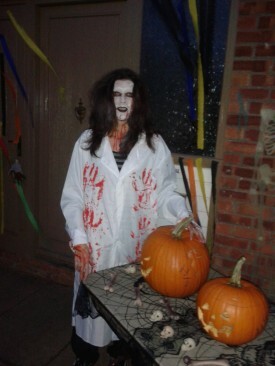 Maria dressed up as a Zombie, she wore a black wig and covered her face and neck in fake blood. She dressed in white clothes splashed with the fake blood. Jodie Camilla dressed up as a Zombie bride. She wore a white dress with a black dress on top. 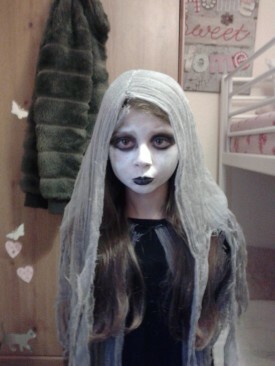 She had a black and white wig and covered her face in white make up. She looked very scary. They went out Trick or Treating and were very lucky and collected lots of sweets and pennies. When all the children had finished the Trick or Treating, one of the neighbours put on disco music and one of the Mums made lots of food and we had a great party. This year they are planning to dress up as a Red Devil and a Skeleton.